While it's certainly a rare occurrence, you may find yourself in the position of needing to replace the door – and only the door – of your microwave. If your microwave door is cracked or has a broken latch, you may not need to replace the entire unit. It is possible to replace the entire microwave door assembly by yourself. Just be careful during the process – and don't be afraid to call a microwave maintenance technician if something seems dangerous. Before doing any repairs, locate the specific make and model of your microwave: if you don't have the owner's manual handy, sometimes this information can be found on the back or bottom of the microwave unit, or printed just inside the microwave door. Once you know the model, you can order the replacement parts. If you have the owner's manual, it may list a part number you can use as reference when looking for a new door – which can generally be purchased through the manufacturer's website for recent models, and Amazon, or a specialty website for older models. Once you have the replacement parts handy, remove the glass tray from inside the microwave and – most importantly – unplug the unit. 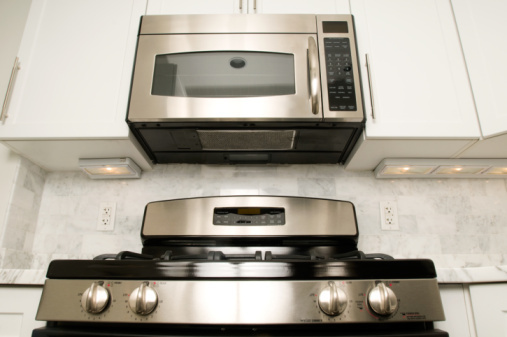 If you have a built-in or over-the-range microwave, you may need to remove mounting screws or retention clips to take the microwave off of its support bracket. Place the microwave on a table or workbench, and identify whether the door hinges are blocked by either a grill or the interior panel of the microwave door. If there's a grill in your way, use a screwdriver to remove the screws securing the grill assembly to the top of the microwave, then push it down and pull it out and off of the unit. If the hinges are blocked by the interior door panel, use a butter knife or flathead screwdriver to pry the plastic panel loose. Then, work the tool around the length of the panel to remove it, and gain access to the door hinges. Depending on the model of your microwave, you may need to remove clips, screws or bolts securing the door to the top hinge. Do so now. Once the microwave door has been unseated, disconnect it from the hinges by either tilting and lifting or sliding the door out on rails. Discard the old microwave door. Once done, attach the new microwave door to the hinges by reversing the steps you took to remove the original door. Reattach and secure the clips, screws or bolts, and test the door by opening and closing it a few times to ensure it was installed correctly. Once the door is secured, return any grill assemblies to their original positions, and return the microwave unit to its original place. Return the glass tray to the microwave's interior, plug it back in and enjoy your revitalized microwave. Can I Put a Countertop Microwave in a Built-In Microwave Hole?